The United Nations doesn’t have Peacekeepers, they have soldiers deployed as Peacekeepers. Peacekeeping missions are not military operations, therefore, Peacekeeper training should better reflect the peaceful mandate of the UN and abandon the militarized culture and tactics present in today’s Peacekeeping forces. Robust Peacekeeping: The use of force by a United Nations peacekeeping operation at the tactical level, with the authorization of the Security Council, to defend its mandate against spoilers whose activities pose a threat to civilians or risk undermining the peace process. 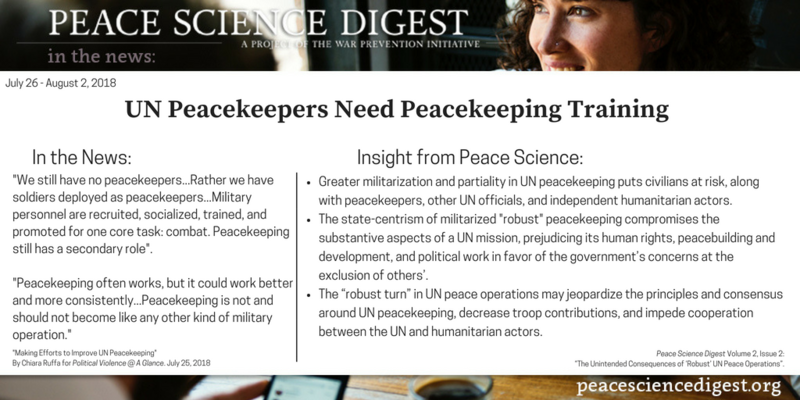 Peace Science Digest Volume 2, Issue 2: “The Unintended Consequences of ‘Robust’ UN Peace Operations”.